Jackson Blue Springs | Florida Hikes! Blue Springs Recreation Area. More photos on Flickr. 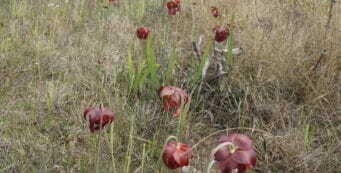 Managed by Jackson County, the park is only open daily from Memorial Day through June and July, and on weekends in August through Labor Day. 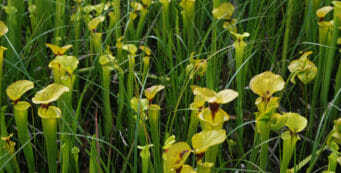 At other times of year, the spring may be seen by taking a boat or paddling upstream along Merritt’s Mill Pond. Pets are not permitted. 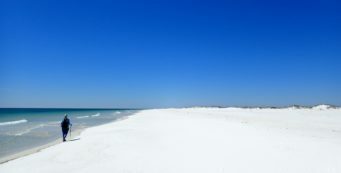 From exit 142 for Marianna on Interstate 10, drive north on SR 71 for 2 miles. Turn west onto US 90 and follow it into Marianna for 1.7 miles. Stay in the right lane and turn north on SR 71, continuing on it for 1.1 miles. Turn right onto Blue Springs Rd and drive 3.3 miles. 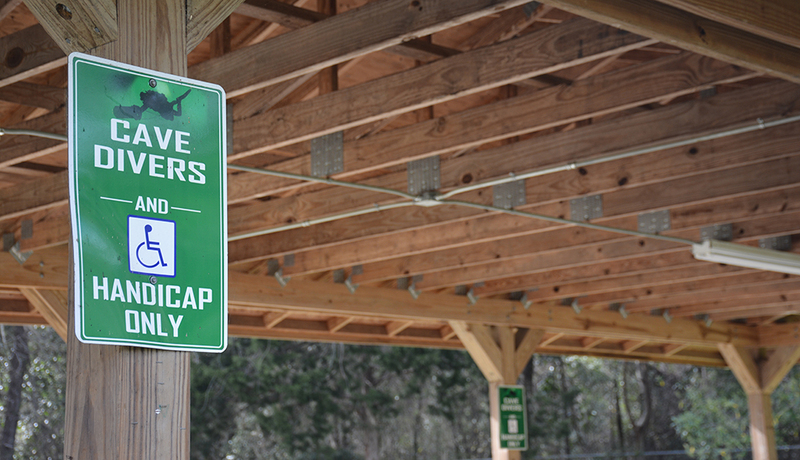 Look for the large park entrance sign on the right at 5461 Blue Springs Rd. 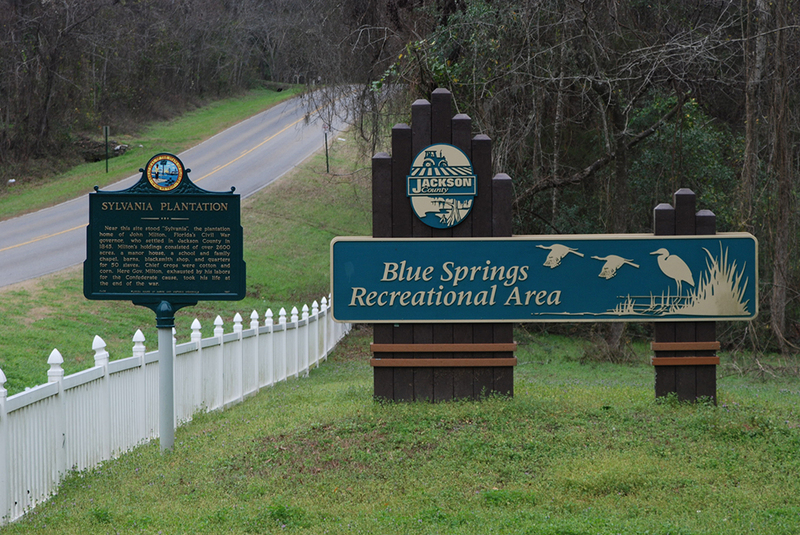 It’s the sheer size of the spring basin that captures your attention upon entering Blue Springs Recreation Area. 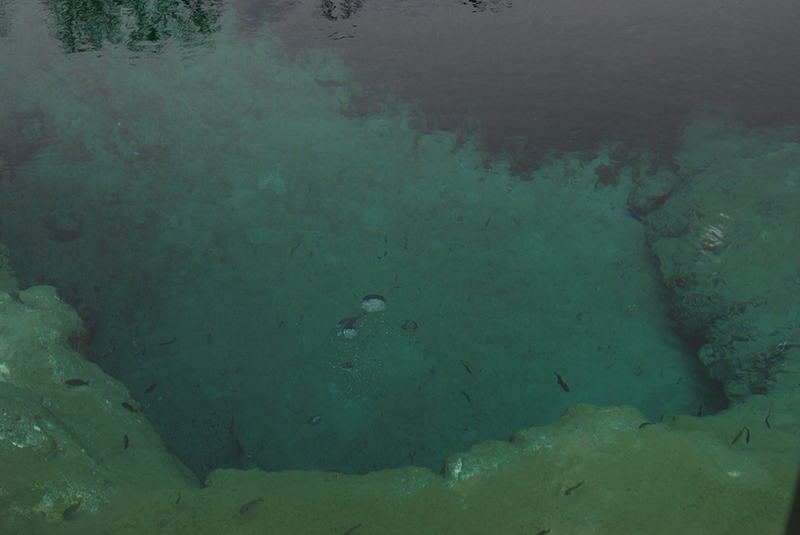 While the spring itself is over near the diving board – and you can peer down into it very easily, it’s so clear – the surrounding basin is just as clear, its surface reflecting aquamarine, teal, and deep blue depending on the depth and vegetation in the bottom. An astounding 64.6 million gallons of water pours out of Jackson Blue Spring daily, feeding a broad waterway known as Merritt’s Mill Pond. John sitting in a lifeguard’s chair. Our visits have been off-season. 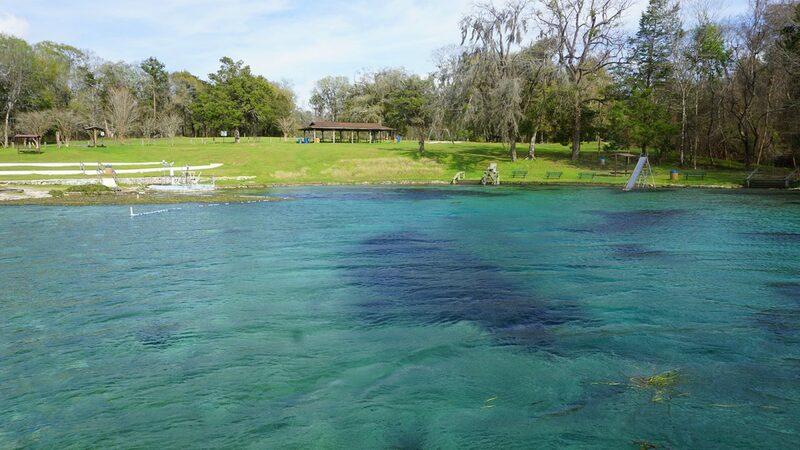 In addition to swimming and diving in the main spring, you can snorkel across the basin or rent a canoe or kayak ($10 per hour) to float downstream and snorkel the smaller springs, like Shangri-La, Indian Washtub, and Twin Caves, all of which are within a half mile of Jackson Blue. Draped in Spanish moss, the cypresses lining the waterway are hauntingly beautiful. Families will appreciate the children’s playground and picnic pavilions, the slides into the spring basin, and the fact that lifeguards are on duty. Paddleboats and tubes are for rent along with the kayaks and canoes. The Blue Springs Nature Trail, rambling several miles through the uplands, starts right near the main parking area. Imagine, if you will, a grand mansion standing in the woods above the spring. Where the upper grassy terraces are now in place for sunbathers, a forest of hickory and oak and Southern magnolia would have been. 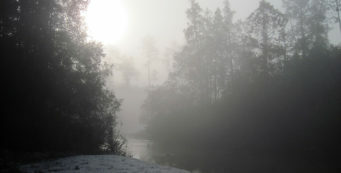 Along the original natural edge of the spring, which is hidden by man-made beaches, cypress would have lined the waterway as it does so well downstream. This was Sylvania – by its very name, a wooded place – the plantation owned by John Milton, the fifth man to serve as Florida’s governor. It was Governor Milton that urged the state into secession, and who presided over a divided Florida during the Civil War, ensuring that important homegrown food, cattle, and salt-making served the greater needs of the Confederacy. I had the pleasure of reading through original copies of his correspondence while working on my book Florida in the Civil War. In a tragic turn, he abdicated his position by committing suicide just a month before the Confederate States surrendered, here at his beloved home. The spring itself has been attracting visitors ever since. The image above is from the 1880s. 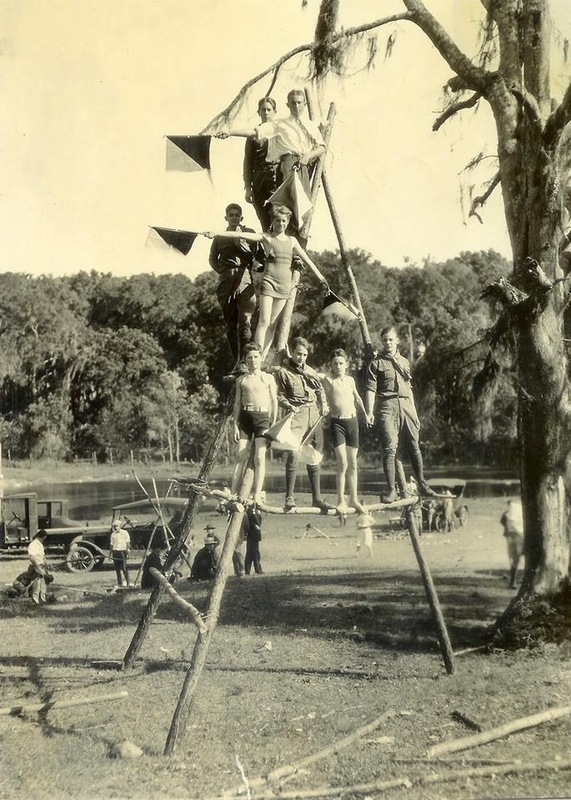 In this 1920s photo we saw on a wall in Marianna, Boy Scouts are atop a signal tower they’ve built with Jackson Blue Spring as a backdrop. 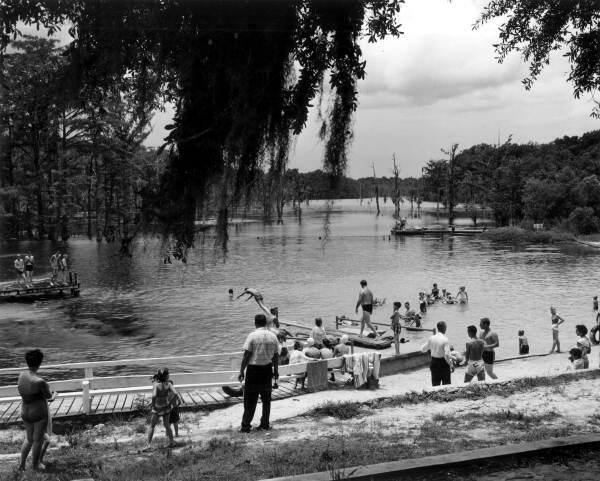 This photo from the Florida State Archives shows swimmers enjoying a natural setting among the cypresss trees along the edge of the spring. During World War II, Graham Air Base opened nearby for training the Army Air Force. 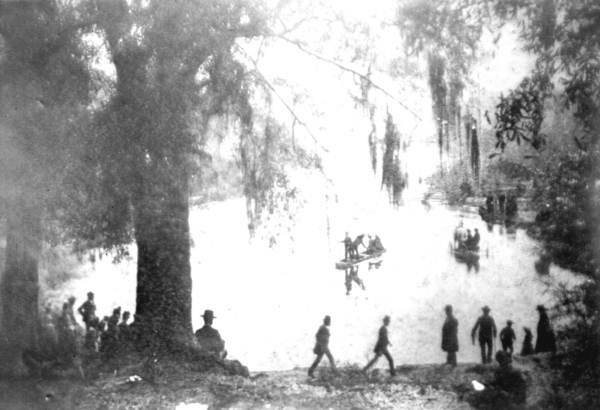 The officer’s club was built here along the spring run, sitting high on a bluff overlooking Merritt’s Mill Pond. We were shown it on a personal tour many years ago. 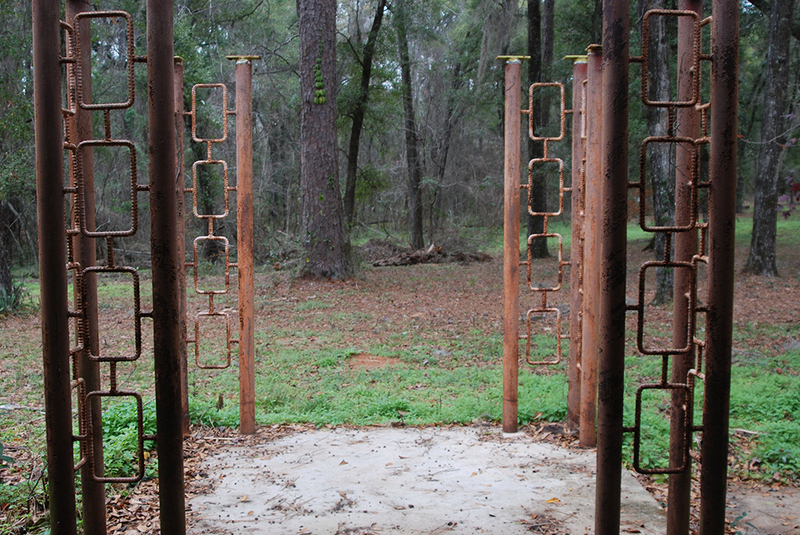 There are hopes of restoration of that complex, but for now it remains closed to the public. We wondered, as many do, why is the park not open more than a few months a year? In actuality, it is, but for a very select group of people that come from around the world to experience it: cave divers. 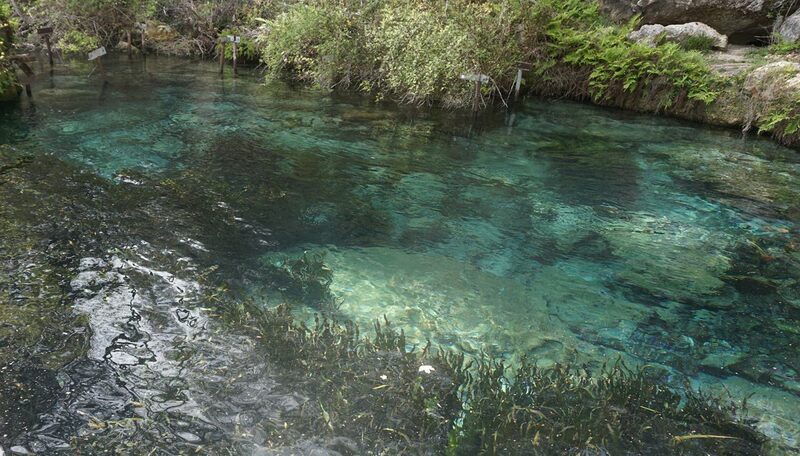 Many years ago, diver Edd Sorenson came to Marianna to dive Jackson Blue, having heard it was one of the clearest first-magnitude springs remaining in Florida. 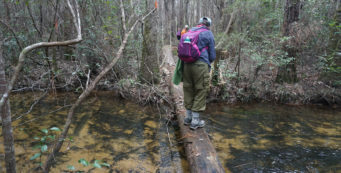 He was so impressed with the clarity of the water that he returned to the Southwest, sold his home, and came to Marianna to start a business, Cave Adventurers. 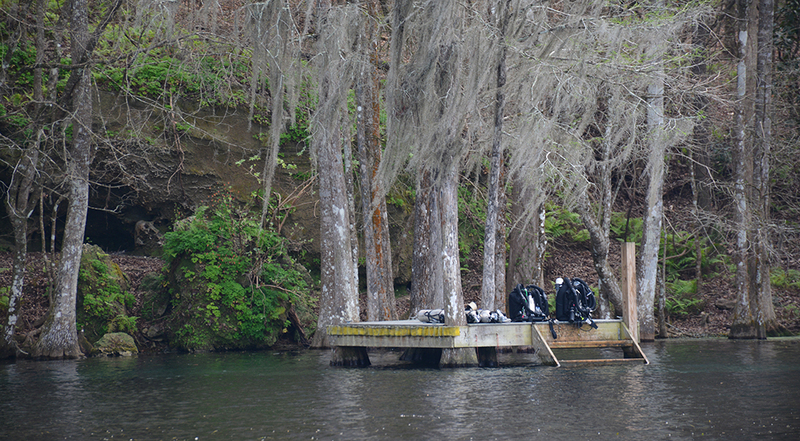 While diving the spring itself remains extremely popular – and must be arranged through Cave Adventurers, $30/day dive fee for certified divers – the spring is now a central place for local dive masters to provide dive training. A broad variety of courses are offered, from open water to night dives to three levels of cave diving, but the specialty here is teaching experienced divers how to use sidemount tanks for cave diving and rescue. 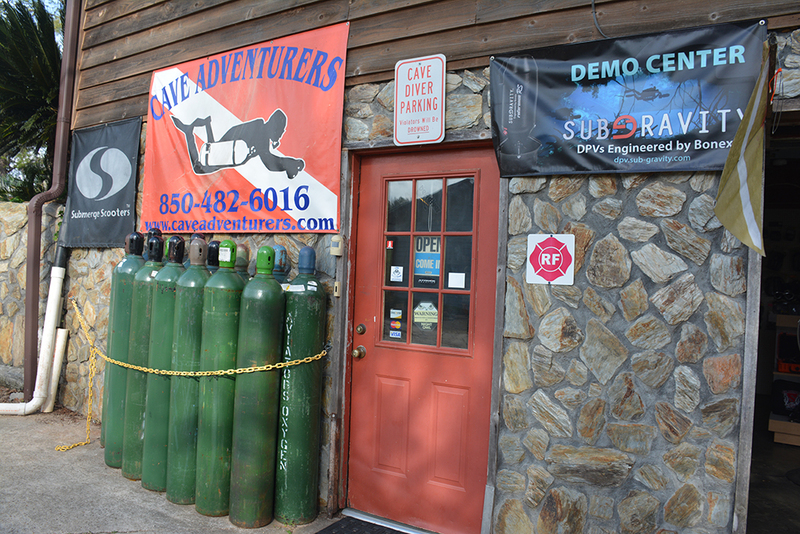 Located downstream on Merritt’s Mill Pond, Cave Adventurers has rental gear, air fills, scooter and boat rentals, and even lodgings for divers who want to come and stay a while.